STEM stands for Science, Technology, Engineering and Math. STEM is more than the sum of it parts! Science, technology, engineering and math are disciplines in their own right, but STEM is what happens when they are all taught together and in support of each other. Science is our content knowledge, that might be knowing colors and shapes in Preschool, animal habitats and adaptations in Younger Kids and Middle Kids, or the periodic table in Older Kids. Technology, in STEM, is anything that helps meet a human need or want—a rubber band, a desk, a whiteboard—those all meet needs or wants, and are all technologies, even if they are not electronic or computerized. Engineering is how we solve problems. With engineering, we will focus on solving real-world problems, and think about, or draw, a design before we build. Engineers always remember that failure is OK. 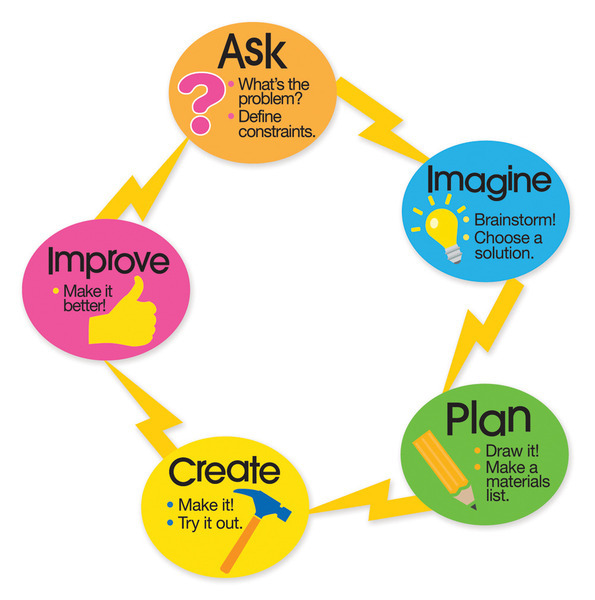 If our first solution fails, we go back to improve our design (see the engineering design process graphic below). Math is how we measure or count in STEM. Anytime we measure distance, volume, or time, we are using math. STEM will be happening at all grades, preschool-6th. In general STEM will be incorporated as part of our interdisciplinary units, but it will look different in each grade and each classroom. Sometimes students will have STEM once a week, at a certain time, where we will be developing the foundational skills, or analyzing data and presenting our findings. Other times, they will do STEM every day. For example, we might do an engineering design challenge on Egypt or desert adaptations, and we would need to work on testing and improving our design more often than once a week.